Germany, Bavaria, Munich. Ernst I, Ad 1397 to 1438. Silver pfennig. Denomination : Silver pfennig. Mint : Munich. 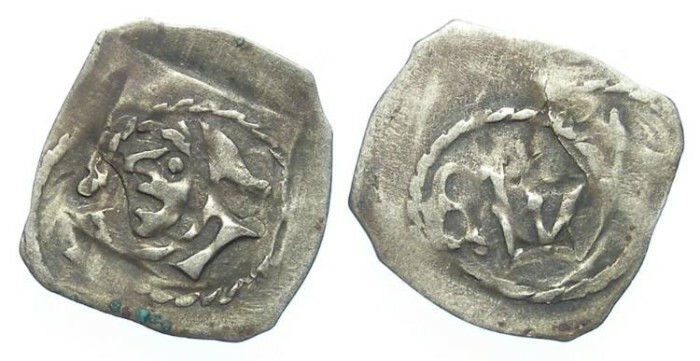 Date : Struck between AD 1397 and 1438. Size : 14.3 x 15.0 mm roughtly square. Weight : 0.42 grams. Reference : Saurma - 970. Grade : VF, nicely toned. There is a striking crack within the coin that does not extend to the edges. When held to a light no light passes threw, but the crack is visible on both sides of the coin. Obverse : Monk's head left. Reverse : EW in a circle.